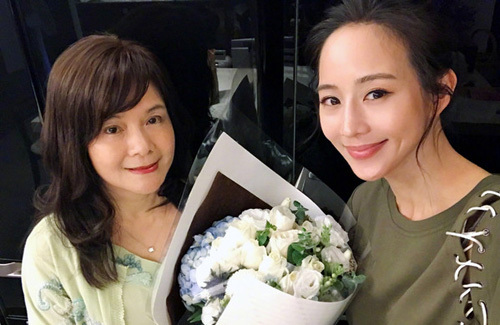 Above: Janine Chang with her mother. Due to the popularity of Chinese drama, Here to Heart <溫暖的弦>, Taiwanese actress Janine Chang (張鈞甯) is once again in the center spotlight. Many fans were enraptured by her on-screen persona, praising that she oozed with charisma and sophistication. Not only is Janine a delight onscreen, but the 35-year-old actress also highly educated and hails from a well-to-do-family. Janine was born in Munich, Germany to a Taiwanese father, who is a college professor, and a mother, who is a published writer. While still attending National Taipei University, she debuted at 21 years old and took a two-year break from school in order to focus on establishing her career. Despite debuting to relative success, Janine felt that education is important and was determined to complete her degree. She slowed down her work output and obtained her bachelor’s degree in law. Hmmm… A great lawyer can defend an innocent man or keep the world safe by prosecuting them. Can organize rallies and effect change. Most great people studied law, and they achieved great things by being poor but steadfast in their principles. Joining entertainment world os really about finding fame and fortune. Those aspiration of helping others come later. While obtaining a law degree is admirable but wasting it in acting? Hummmm…I don’t get it. I think she is thinking that she can use fame and fortune to help the poor? Good on her noble aspirations. Is she currently active in any NGOs? there are plenty of very smart people in show biz. i recall the leehom gave up on his harvard admission to proceed his dreams. also matt damon, ben stiller, Natalie portman, etc also had an ivy league education. I can understand that many may think that Janine chose acting over helping those who require legal assistance. Has it occurred to anyone that she chose the career that is her passion? Why chose a career path when her heart and soul is somewhere else? There are plenty of lawyers out there to help those in need of legal assistance. Recently there was an article about an actor who gave up acting to pursue his dream job, and he makes way less than when he was acting. It is about being happy and fulfilled in your job. Not a lot of workers achieve that. No one should hold her for choosing acting over being lawyer really. She did not say being lawyer is bad or can’t help innocent people, she possibly thinks acting can help those that moved her much better. Plus being Asian to a professional parents, it’s possibly her parents’ wish that she becomes a lawyer, it was not her dream or desire, and understand who she is, being a reserved person, it is not suitable to be a lawyer lol. Plus she will need to do a lot more works, and being who she is, she might not able to reach the same status and therefore won’t be able to help the people she wanted to help.